Well, I have been getting ready for camping and am ready enough to go do it. Since I live in Angels Camp California and Calaveras Big Trees State Park is only 22 miles up the hill from me, I am going to go do an overnight there on Monday. Yep, that is Christmas, but I live alone and have nothing else to do, so I figure that will be a gorgeous place to be on Christmas. Most of the campsites are closed, but there are about 23 that are still open and usable according to the rangers there. Should be fun. Gonna try to keep the whole food thing simple so I have minimal clean up. I figure in the daytime I can go hike the easy trails to the North Grove. I have lived in California for 67 years and have never seen those Giant Sequoias.... it's about time! 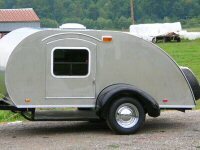 If you happen by, I will be in a 5x9 American Teardrops trailer pulled by a white Toyota RAV4. If you see me, say hello! michaeln wrote: Well, I have been getting ready for camping and am ready enough to go do it. Since I live in Angels Camp California and Calaveras Big Trees State Park is only 22 miles up the hill from me, I am going to go do an overnight there on Monday. Yep, that is Christmas, but I live alone and have nothing else to do, so I figure that will be a gorgeous place to be on Christmas. Merry Christmas! My plan exactly for this holiday except I'm going to French Creek park in PA. Enjoy! Since we're having a family situation, I'll be spending Christmas in my Tear in my father's driveway with the Dog. Then it's off to the hospital to be with family member having surgery. Temps look fairly decent for this time of year in Pa. I didn't know anything in Pa except Ole Bull State park was open. Where at in French Creek?